The past week and a half has been somewhat crazed. Nothing more than any of the rest of you handle on a regular basis. It is partially one of the many reasons why we love what we do. Like I explained to someone today, it's the good and the bad all sandwiched together that make it awesome. The good days make the bad days bearable and the bad days make the good days great. Right? I honestly welcome this change. Our property has been so quiet as of late. And I hate to admit it, but, easy. There was not a lot of standard property management stuff going on. Enough to keep content going on the blog, specifically in regards to hiring processes, HA! But otherwise, fairly mundane. Until this last week. Which in turn turned into content about damage control. I'm not even certain where to start. But the story does need to be prefaced with the fact that certain specifics will be left out for anonymity purposes and certain details will be provided to lay the groundwork for where this is going. Last week I had an employee out all week with the stomach flu. I had another employee out for a day with it. I had another employee out two days for having worked the weekend. I had a new employee start midweek. We had eleven move ins (six of which were immediate ASAP move ins) and nine leases. Are you holding your breath yet? Probably not. In the world of property management, every story can be topped. Trust me, I know. But in the moment, it's your story. And this is mine. In the middle of all of this craziness that is our passion, our love, and our job.....an incident happened. Doesn't that always happen? I mean, really, all of the above is pretty standard stuff, short staffed or not. But throw a wrench in it and then it's just a big ball of a mess. An unleashed dog was hit by one of our golf carts. Yes. That happened. In between trying to ensure everything else was getting done. The dog was hurt fairly badly, requiring many stitches. My team member was shook up about it. The dog owner was obviously pissed off. I wasn’t very happy considering the entire situation of the dog having been hit, on top of the dog being unleashed. I knew that this was going to be……a disaster. And it was, to a certain degree. (Mind you, after several years of doing this and aging while doing it, I’ve managed to quell my need to operate in crisis mode….which will result in another post about not allowing yourself to operate that way). While it was a disaster, I took a deep breath and managed to get outside of crisis mode operation and prepare myself for what I knew was coming. 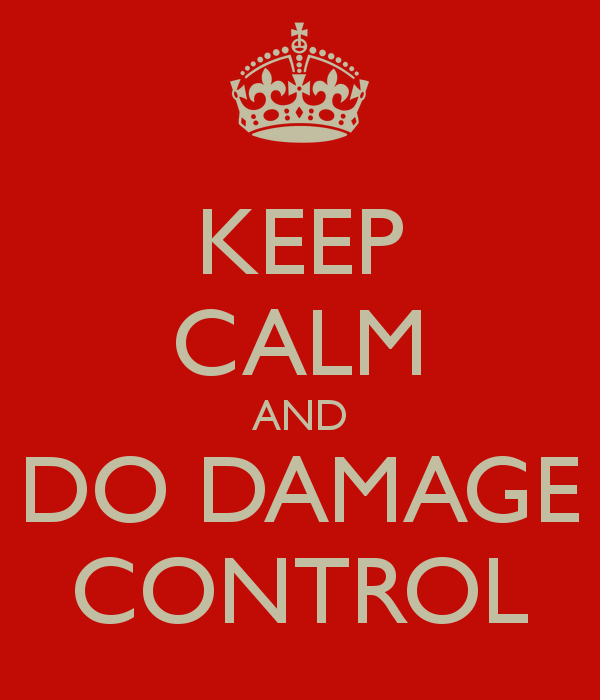 There are a quite a few things I want to take the time to point out in regards to damage control. I realize that it took me awhile to get to the purpose of this post. However, if you’re a follower of mine, you’re used to that by now. I have to tell a story to get to the point. So here’s the point, damage control is easy if handled in several different ways. And these are simply tips & hints. Every situation will call for it’s own way of being addressed, depending on the nature of the disaster. 1. Never ever allow yourself to operate in crisis mode. The best way for me to describe crisis mode is this: “running around like a chicken with your head cut off.” Do not do it. Running around in a panic will not alleviate the situation. It won’t make you look as though you’re handling it better because you’re in more of a panic than anyone else. It makes people want to slap you and scream, “GET A GRIP MAN!” Don’t be that person someone else wants to slap. 2. Do NOT under any circumstances take anything personally. While we claim fiduciary responsibility proudly and call our properties OURS, you MUST separate yourself from disasters and the things said to you and not take it personally. I only say this because once you start taking things personally, you begin getting defensive. And defensive vs. sympathetic can land you in a world of trouble. (Think of your child’s tone of voice when they get defensive with you…..) Always stand up for what you know is right, always be serving your customer, but do it with the business side of you in charge, not the personal side of you in charge. And #3 may wind up getting a lot of comments and backlash on here but I am willing to say this with complete confidence…. 3. Do not apologize immediately. I say this because, honestly, we are not always in the wrong and apologizing is an immediate admission of guilt and wrong-doing. Feeling bad, feeling sympathy, being regretful that something bad has happened is different than being apologetic. And please, do not take this the wrong way, myself and my teams have been in the wrong before. I WILL apologize, I will do what I have to do to make that resident happy. I will be the first to ensure customer service is being maximized to its fullest extent. In all situations, even the ones where an apology may not be due. I will practice customer service all day long. But myself, nor my team will be a doormat or an excuse for someone else’s negligence. 4. Always ensure that your corporate office is made aware. Immediately in most instances. I am all about property managers not being micro-managed and being empowered to make executive decisions. I believe that is what makes us better managers. HOWEVER, when a disaster happens, your corporate office needs to be made aware. Because you can rest assured the resident is more than likely going to call corporate. Possibly before even talking to you. If you do not like being blind sided, then pay the same respect to your corporate alliances and don’t allow it to happen to them. And in light of using the word “alliances”, I hope that each of you have an alliance at corporate. Ours are always in our corner. They go to bat for us and defend us when it’s due & just. And I am beyond thankful for that.